South Africa’s penguins are called Jackass penguins because of the braying calls they make. There are penguin colonies in several locations on the South African coast and small offshore islands between Cape Town and almost up to Port Elizabeth. These comical birds in their glossy black and wine are endemic to South Africa and live exclusively on fish and crustaceans. This inevitably pits them at odds with fishermen. Great efforts are being made in South Africa to protect the immediate environment of these penguin colonies and in places such as Betty’s Bay, walkways have been built to allow people to view the penguins going about their daily lives without harm. A visit to Betty’s Bay, east along the coast from Cape Town, near Hermanus where people catch boats to go whale spotting is a spectacle not to be missed during breeding time. There is something most enthralling about viewing penguins en-masse, standing in small groups like Jews praying, or gliding effortlessly through the water in search of fish. Penguins breed in February and September, laying 2 greenish coloured eggs in burrows. A penguin in the wild may live up to about 20 years. Their predators are leopard, feral cats, and sharks and seals in the sea. 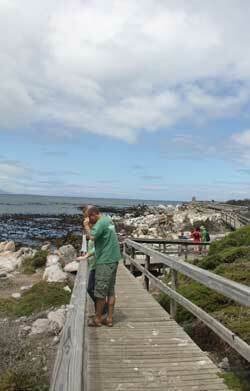 Boulder’s Beach in Simonstown– a large colony of penguins, sandy beach, boardwalk, tea room nearby, small entrance fee. Betty’s Bay, mostly rocky section to one side of the bay with a boardwalk/walkway for people, tea room nearby, small entrance fee. Need holiday accommodation for your stay in South Africa?